Kitchen Window: The Glorious Pasta Of Summer Beat the heat (and the spaghetti-and-meatball doldrums) by pairing fun pasta shapes with fast, fresh sauces — hardly sauces at all, actually, but simple sautes of vegetables and herbs in olive oil. 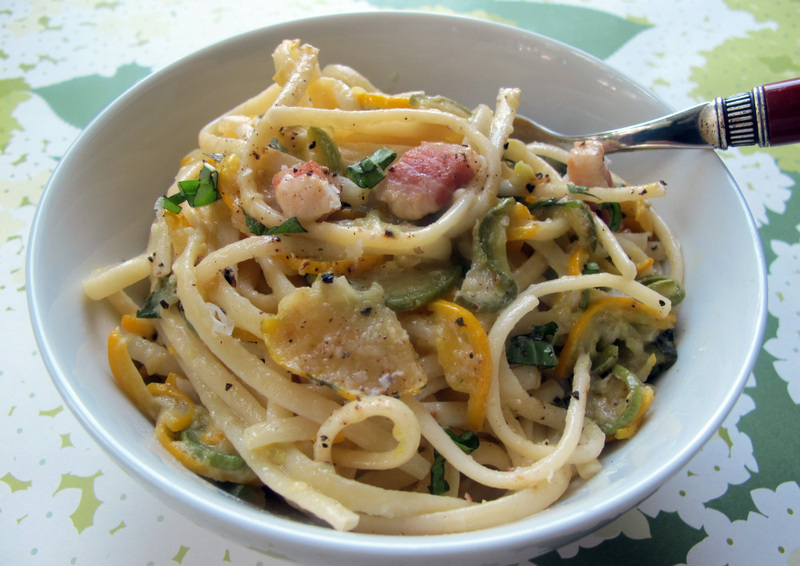 Get recipes for BLT Bucatini, Fusilli With Fresh Herbs And Chopped Olives, Cavatappi Alla Siciliana, and Linguine With Slow-Cooked Zucchini, Basil And Cream (above). If I say the words "pasta sauce," I'm pretty sure what sort of image it will conjure in your head: a big plate of spaghetti with dark red tomato sauce ladled thickly over it. Maybe topped with a couple of meatballs. There is certainly nothing wrong with a nice dish of spaghetti and meatballs; it's just not what I crave in midsummer. I'm guessing you feel the same way. Summer sauces are fast and fresh. In many cases, they are hardly a sauce at all but rather a simple saute of fresh vegetables and herbs in olive oil. Fortunately for pasta lovers like me, this does not mean having to forsake my favorite food between June and September. In fact, while it may seem counterintuitive, summer is one of the best times of the year to enjoy pasta. Think about it: What better way to showcase summer's glorious bounty of fresh vegetables and herbs than to pair them with a bowl of silky linguine or pretty bowtie pasta? Right now, shiny eggplants, summer squashes (some with their blossoms still attached), tomatoes — plum, heirloom, and cherry — and spicy salad greens are already piled high on tables at the farmers markets near my house in northern Virginia. Sweet peppers — red, gold, orange and purple — are up next. All of these find their way into my pasta sauces in summer. And when I say "sauce" I don't necessarily mean a saucy sauce or a pasty tomato sauce and definitely not a meat ragu that has been simmering on the stove all day. Summer sauces are fast and fresh. In many cases, they are hardly a sauce at all but rather a simple saute of fresh vegetables and herbs in olive oil. 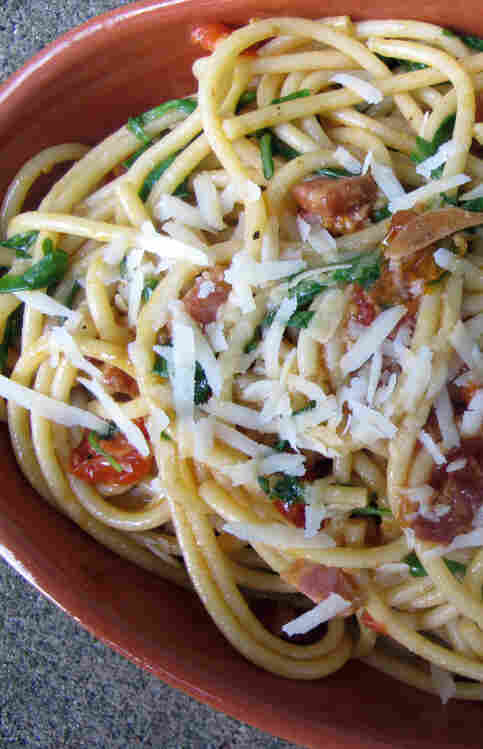 If there is meat involved, it's usually a bit of sauteed pancetta, which adds a lot of flavor but not too much heft. Italians use the verb condire — to dress — when referring to saucing their pasta. And they often refer to the sauce itself as un condimento — a condiment. To me, this is the most accurate description of the way pasta ought to be served. If you've ever had the pleasure of enjoying a dish of pasta in Italy, you know that Italian cooks never douse their pasta with sauce. Domenica Marchetti is the author of cookbooks including The Glorious Pasta of Italy (Chronicle Books, 2011), The Glorious Soups and Stews of Italy (Chronicle, 2006) and Big Night In: More Than 100 Wonderful Recipes for Feeding Family and Friends Italian-Style (Chronicle, 2008). Her articles and recipes have been featured in The Washington Post, Fine Cooking and Food and Wine, and on the Leite's Culinaria food blog. Visit her website for recipes and stories about Italian home cooking. Instead, they lightly toss the cooked noodles together with a judicious amount of sauce — whether it's a winter meat sauce, a summer vegetable sauce or something as simple as olive oil, garlic and parsley. They also add a splash or two of the starchy water in which the pasta is cooked to help bring the noodles and sauce together and to prevent clumping. Stick with that simple technique, and with the season's peak vegetables, you will always have a fresh pasta sauce at the ready. When I say pasta, I mean more than spaghetti. Yes, traditional, ubiquitous spaghetti is always welcomed at my dinner table. However, there are countless other great pasta shapes — from long, slippery linguine to short, fat rigatoni. Many supermarkets and gourmet shops carry artisan pasta brands that feature whimsical shapes with catchy, revealing names such as orecchiette (little ears) or strozzapreti (priest stranglers). The world of pasta is broad. It is also flat, wide, round, narrow, fat, skinny, ruffled, curly and loopy. Pairing these fun shapes with summer's colorful vegetables brings even more appeal to one of the world's most appealing foods. Be sure to cut vegetables, such as eggplant or zucchini, into bite-size pieces so that they will cook uniformly and mix well with pasta. Don't undercook the vegetables. Pasta with summer vegetables is not the same as pasta salad. Vegetables that are undercooked will not absorb oil, tomatoes, or pasta water and will not be the right consistency to properly meld with and flavor the noodles. Don't forget summer herbs. Fresh basil, mint, thyme and oregano are just a few of summer's prolific herbs. 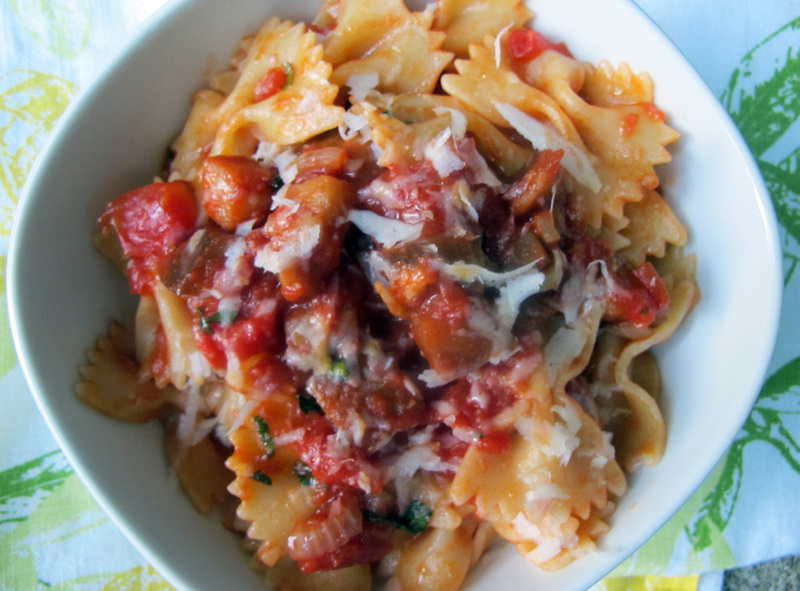 They enhance the flavor of summer vegetables and are delicious tossed with pasta. Add cheese. Almost all summer vegetables pair beautifully with Italian cheeses such as Parmigiano-Reggiano and pecorino romano, so don't forget to add a generous sprinkle of grated cheese as you are tossing your pasta and vegetables together. Who doesn't love a good BLT sandwich, one packed with lots of crispy-chewy bacon, meaty ripe tomatoes and crunchy lettuce? 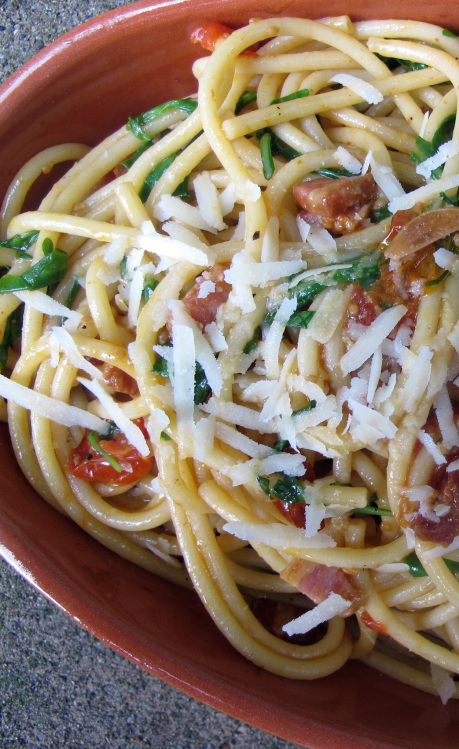 I do, which is why I knew I couldn't go wrong with this Italian riff on that American classic, with slow-roasted cherry tomatoes, chunks of spicy pancetta and peppery arugula standing in for the bacon and lettuce, and pasta in place of the bread. Get a head start by roasting the cherry tomatoes early in the day. 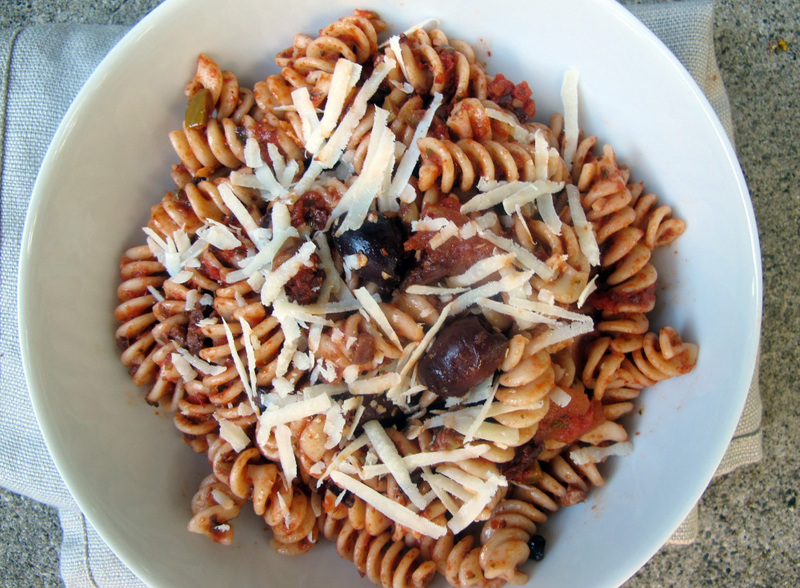 This recipe is adapted from my book The Glorious Pasta of Italy (Chronicle Books 2011). While the water is heating, warm the olive oil in a large frying pan placed over medium heat. Add the pancetta and saute, stirring frequently, for 8 to 10 minutes, or until the pancetta begins to render its fat and turn somewhat crispy. Stir in the tomatoes and cook, stirring occasionally, for about 5 minutes, or until they are heated through. Turn off the heat and cover the sauce to keep it warm. Add the pasta to the boiling water, stir to separate the noodles and cook according to the manufacturer's instructions until al dente. Reserving about 1 cup of the cooking water, drain the pasta in a colander set in the sink. Transfer the pasta to the frying pan and gently toss the pasta and sauce to combine thoroughly, adding a splash or two of the cooking water if necessary to loosen the sauce. Add the arugula by the handful and continue to toss for a minute or so, or until the greens are just wilted. Transfer the dressed pasta to a warmed serving bowl or to warmed shallow individual bowls and sprinkle the pecorino over the top. Serve immediately. *To make slow-roasted cherry tomatoes, heat the oven to 275 degrees. Cut the tomatoes in half and arrange them in a single layer on a large rimmed baking sheet. Drizzle 1/4 cup extra-virgin olive oil over the tomatoes, then scatter 2 thinly sliced garlic cloves over them. Season with salt and pepper. Roast for about 2 hours, or until the tomatoes have collapsed and shriveled a little but are still moist. Let cool and use immediately, or store in a tightly lidded container in the refrigerator for up to 1 week. I like to use an earthy mix of garden herbs in this sauce adapted from my book The Glorious Pasta of Italy (Chronicle Books 2011). Choose your favorite mix, or even a single herb that you are particularly fond of. Just be sure to use a lot of it. While the water is heating, warm the oil and garlic in a large frying pan placed over medium-low heat. Cook, stirring occasionally, for about 5 minutes, or until the garlic releases its fragrance. Sprinkle in the herbs and the olives and brine, and raise the heat to medium. Stir to combine and saute for about 1 minute, then pour in the tomatoes and season with salt and pepper. Raise the heat to medium-high and simmer, uncovered, for 15 to 20 minutes, or until the tomatoes have thickened into a sauce. Turn off the heat and cover to keep warm. Add the pasta to the boiling water, stir to separate and cook according to the manufacturer's instructions until al dente. Reserving about 1 cup of the cooking water, drain the pasta in a colander set in the sink. Transfer the pasta to the frying pan and gently toss the pasta and sauce until thoroughly combined, adding a splash or two of cooking water if necessary to loosen the sauce. Transfer the dressed pasta to a warmed serving bowl or to warmed shallow individual bowls and garnish with the cheese, if using. Serve immediately. *Peeling and grating tomatoes is my favorite way to prepare them for sauce. It works beautifully and produces a lovely fine pulp that requires no additional milling. I prefer it to blanching, peeling and chopping the tomatoes, which I find is just as laborious and can make the tomatoes mushy. Here's how to do it: Cut the tomatoes in half lengthwise and scoop out the seeds with your fingers (I do this over the sink). Place a box grater on a cutting board with a moat to catch the tomato juice as you grate. Hold the cut side of a tomato flat against the large holes of the grater and grate the tomato, pressing it gently, until only the skin is left in your palm. Continue until you have grated all the tomato halves. As you work, transfer the pulp to a glass or stainless-steel bowl to prevent too much from accumulating on the cutting board. Eggplant and mint are a classic Sicilian combination. 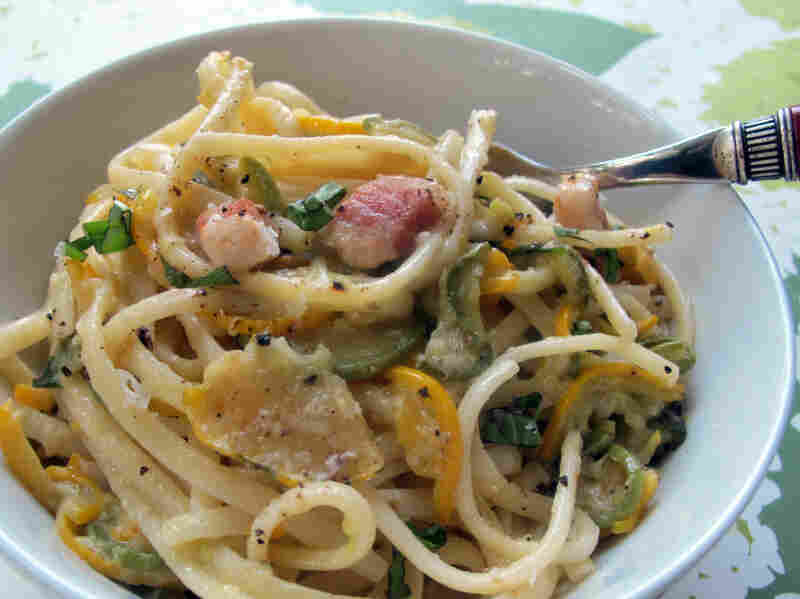 Both are plentiful and at their best in summer, which is the best time to make this brightly flavored dish, adapted from my book The Glorious Pasta of Italy (Chronicle Books 2011). 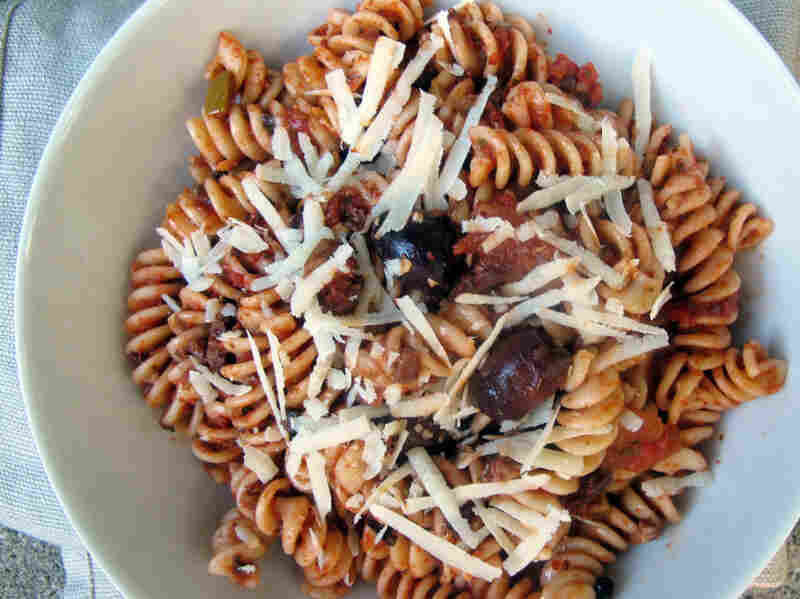 Cavatappi are short, ridged corkscrew-shaped pasta. 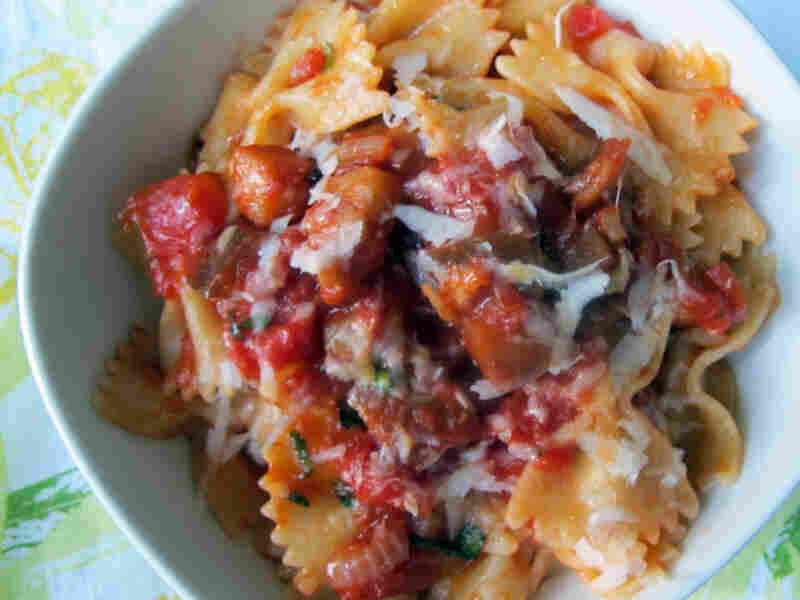 If you can't find them, substitute another short, sturdy pasta shape, such as rigatoni or even farfalle (bowties). While the water is heating, put the olive oil, onion and garlic in a large frying pan. Place over medium heat and cook for about 7 minutes, or until the onion is softened but not browned. Stir in the eggplant and cook, stirring occasionally, for 10 to 15 minutes, or until it begins to soften and turn golden. Pour in the tomatoes, season with salt and pepper and raise the heat to medium-high. Bring the sauce to a boil, reduce the heat to medium or medium-low and simmer, uncovered, for 15 minutes, or until the tomatoes have thickened into a sauce. Sprinkle the mint and balsamic vinegar over the sauce, stir, and simmer for 5 minutes more. Add the pasta to the boiling water, stir to separate, and cook according to the manufacturer's instructions until al dente. Reserving about 1 cup of the cooking water, drain the pasta in a colander set in the sink. Transfer the pasta to the frying pan and gently toss the pasta and sauce to combine thoroughly, adding a splash or two of cooking water if necessary to loosen the sauce. Transfer the dressed pasta to a warmed serving bowl or to warmed individual shallow bowls and sprinkle the cheese on top, if you like. Serve immediately. A wonderful thing happens to zucchini when you slowly cook it over a low flame. It transforms from a bland, watery vegetable to a lovely, pulpy sauce with a subtly nutty flavor. 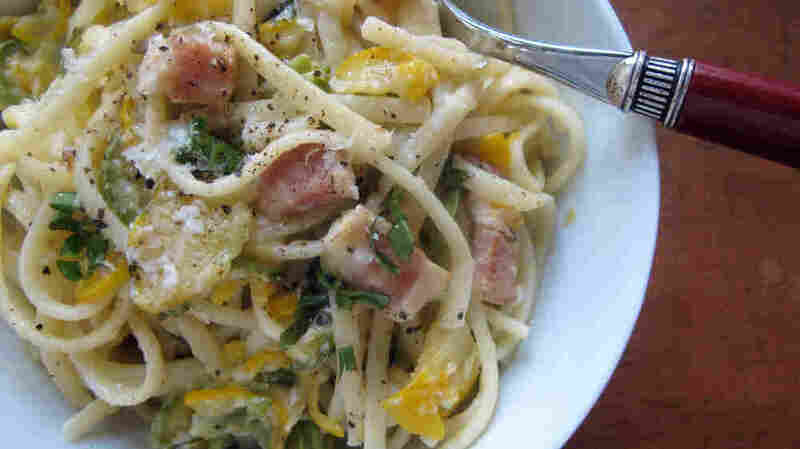 Of course, the addition of good olive oil, savory pancetta and cream doesn't hurt. Slippery linguine is my first choice here, but spaghetti works well, too. This dish, adapted from my book The Glorious Pasta of Italy (Chronicle Books 2011), is light yet substantial, so I like to serve it with a side of sliced tomatoes drizzled with olive oil and sprinkled with salt and chopped fresh basil. Warm the olive oil in a large frying pan over medium heat. Add the pancetta and saute, stirring frequently, for 8 to 10 minutes, or until the pancetta begins to render its fat and is slightly crispy. Reduce the heat to medium-low and stir in the garlic. Cook, stirring occasionally, for 5 minutes, or until the garlic begins to soften. Do not let the garlic brown. Add the zucchini, salt and a generous amount of pepper and cook slowly over medium to medium-low heat, gently tossing from time to time, for about 30 minutes, or until completely tender. The zucchini should be very soft and pulpy, and some (but not all) of the coins will have broken up. Gently stir in the cream and cook for a few minutes longer, or until the cream has thickened slightly. Turn off the heat and add the basil, tossing the sauce gently to incorporate. Reheat the sauce briefly when the pasta is almost done cooking. Bring a large pot of water to a rolling boil and salt generously. Add the pasta, stir to separate the noodles, and cook according to the manufacturer's instructions until al dente. Reserving about 1 cup of the cooking water, drain the pasta in a colander set in the sink. Transfer the pasta to the frying pan and gently toss the pasta and sauce to combine thoroughly, adding a splash or two of the cooking water if necessary to loosen the sauce. Add the Parmigiano and pecorino cheeses and toss again, adding more cooking water if necessary. Transfer the dressed pasta to a warmed serving bowl or shallow individual bowls and serve immediately.